Enjoy sushi, wine and cheese, and tour this amazing community, River’s Bend at Uncle’s Neck, with navigable deep water, serene natural vistas, and 3-8 acre parcels located just outside of Williamsburg. Check out the newly constructed home by award-winning Hallmark Builders at 7584 Uncles Neck. Register to win a visa gift card! See you Wednesday, June 25th, 4-6pm! Left off Forge Road just past Diascund Road. This is an unparalleled opportunity to own waterfront property in a highly desirable location. Our preferred builders would be happy to walk lots you and answer any questions you may have about this special community. 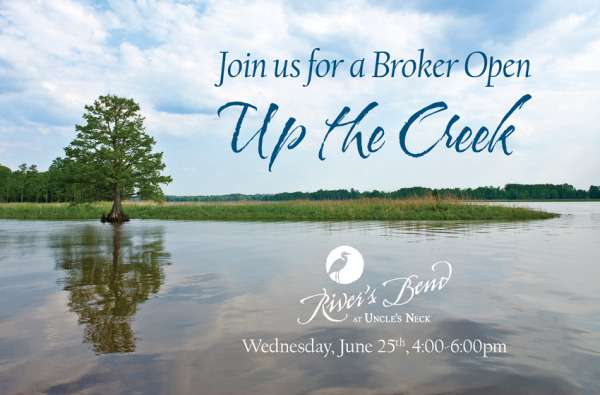 Email us at concierge@lizmoore.com, or click below to request a River's Bend at Uncle's Neck Info Packet.